The region is ful of natural resources such as forests, fish and games. They put totem poles carved with pictures of people and images. They painted the totem poles. In the summer they moved to smaller homes near hunting and fishing places. The chilkat blanket is woven from dyed wool of sheep and goats. The blankets have pictures of shapes and animals that tell a story. The potlatch is a feast to celebrate important events . The country of Spain sent explorers to the land that is now the coast of California. Father Junipero Serra set up a mission in California in 1769 that became the city of San Diego. 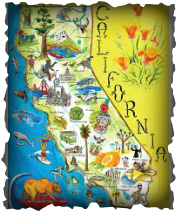 Soon there was twenty one missions in California and explorers from other countrys arrived in the same areas . The united states wanted California and went to war with Mexico to get it . They won the war and this area became part of the United States in 1848. In 1848 James Marshall discovered gold on john sutters's property in California. Word got out and soon Thousands of people were headed to California to strike it rich! These people were called the 49ers because they arrived in 1849. Boom towns grew quickly to help the prospectors . Levi Strauss was a successful merchant who made a fortune sewing and blue jeans for the people looking for gold. Soon the rail road went across the United States so people could move west easily . The boom towns dried up and became ghost towns. Boom towns grew up overnight, did not have police departments. They were usually loud and rowdy places. Cattle drives in the West drove herds from ranches to towns along the railroads. William "Buffalo Bill" Cody in 1883 formed a traveling show that featured trick riding and rifle-shooting! 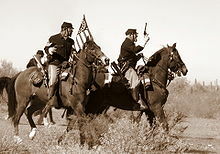 By 1890 the "Wild West" started to calm down, but their life-style continues to live on through songs, stories and movies. Russia sold Alaska to the United States in 1867. The US hoped that fur trapping would help the US economy. Gold was discovered in Alaska in the 1880s and 1890s. Thousands of people rushed to Juneau and Fairbanks in search of gold. These cities grew very quickly. In World War II, Alaska served as an important line of defense for the United States. 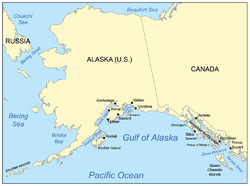 Alaska became a state in 1959. In 1968, a large amount of oil was discovered on the coast of the Arctic Ocean. Workers built an 800 mile long pipeline that would bring the oil to Valdez. The oil was then loaded onto ships and transported around the world. Hawaii is a chain of islands in the Pacific Ocean. The United States made Hawaii a territory in 1900. Hawaiians produced sugarcane and pineapple that was used for exports to the United States mainland. Ports and military bases were built on the islands. Pearl Harbor was built in December of 1941. When the Japanese attacked Pearl Harbor, the United States was brought into World War II. After the war, Hawaii was given statehood in 1959 as the fiftieth state! A pleasant climate makes Los Angeles an excellent location for film making, business, and tourism. Seattle and Salt Lake City are very different places, but both are examples of cities with varied and strong economies in the West. The states of the West engage in a great deal of international trade with the countries of the Pacific Rim. The West has much to offer residents and visitors. 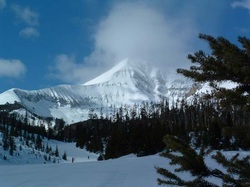 For example, the West has great mountains for skiing and hiking. It is also filled with many natural resources to support our economy.